My Neighbor Totoro remains one of Hayao Miyazaki's signature movies. I’ve encountered a strange internal resistance with several of Hayao Miyazaki’s films. They sit idly in my watch list for way too long yet don’t reach my screen. I’ve yet to dislike any of his movies, but there are still plenty to see. Spirited Away and Howl’s Moving Castle in particular were among my favorites of their particular year. Sometimes it takes an extra push, and the blind spots series organized by Ryan McNeil is the perfect remedy. It’s been an amazing year to discover past gems and finally see classics that deserve that label. These films have sterling reputations for a reason, and the final entry is no exception. My Neighbor Totoro was just the right choice for a quiet afternoon following the holiday chaos. I watched this fantasy with my five-year-old daughter, and she was charmed by it. It’s the rare kind of story that connects with both kids and adults because it feels true to both experiences. 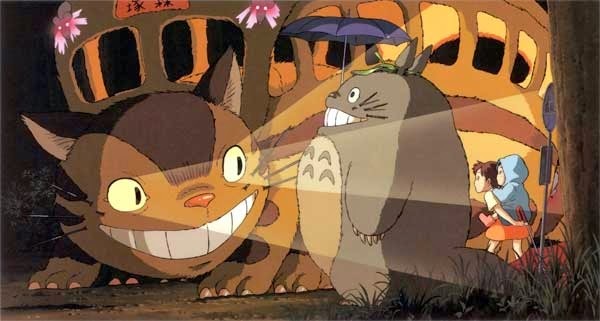 Released in 1988, My Neighbor Totoro remains one of Studio Ghibli’s most recognizable movies. Its title character is the studio’s mascot and familiar to many who haven’t seen this film. It presents a family that doesn’t seem out of place in our world, and that makes their experiences connect with us. Within this real-life framework, friendly forest spirits and a cat bus don’t feel so unbelievable. I watched the English dub from the 2006 Disney release, so I’ll reference those actors in this post. My daughter is still too young for subtitles, and the voice work is stellar and not distracting. I’m relieved that Disney has put together impressive DVDs that have allowed so many young people to catch up with Miyazaki’s work. The setting is Japan in the late ‘50s. Professor Tatsuo Kusakabe (Tim Daly) moves into an old house with his two daughters so they can visit the hospital where his wife Yasuko (Lea Salonga) is recovering. The girls love exploring the strange home and meet some oddities in the nature around it. Satauki (Dakota Fanning) is 10 and seems older, while Mei is four and still discovering the world. She spots a quirky little creature strolling outside the house and follows it into the woods. This leads Mei to King Totoro, who’s likely a troll but named incorrectly by Mei. The big guy forcefully belts out his words, but it’s clear there’s no danger from the cuddly Totoro. Miyazaki’s at his best in this sequence, which delights but doesn’t push too hard to woo the audience. It takes real skill to strike this balance. It's easy to spend time in Miyazaki's welcoming environment. What makes this story work is the relaxed pace, which gives us time to connect with the characters. 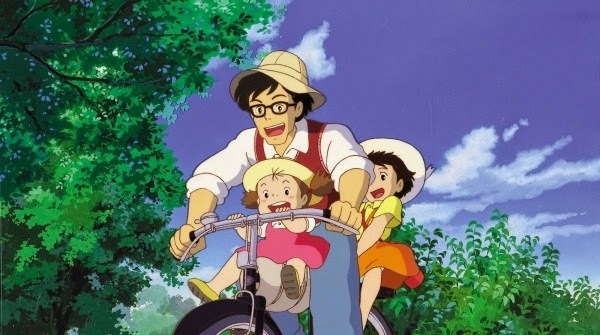 Kusakabe isn’t the typical absent father of many animated stories and loves his daughters. They’re all struggling with feelings about Yasuko’s illness, but it doesn’t overwhelm them. The reactions feel natural, and no one gives a long speech about their emotions. Miyazaki underplays the drama, which makes it strike a much stronger chord. The house is worn down yet remains comfortable, especially for imaginative young girls. There’s a communal atmosphere with the other residents that makes it refreshing. The 88-minute running time flies by despite the laid-back approach because it’s enjoyable to spend time with the characters. The fantasy aspects play a key role, but they’re hardly the only reason to check in with this community. While less direct than environmental fables like Princess Mononoke and Nausicaä of the Valley of the Wind, there’s a love for nature in My Neighbor Totoro. The forest is warm and inviting, and Totoro springs from this friendly landscape. The cat bus glides over the hills and is a fun combination of a modern device with a familiar pet. It makes little sense and isn’t explained, but it hardly matters. Our acceptance is easy because it’s such an inviting place. We want to spend time there, and the plot is secondary. Miyazaki doesn’t overwhelm us with too many creatures or ambitious set pieces. Instead, he keeps it simple and connects us with the girls. It’s possibly his best film, and I was thrilled to take the plunge and spend time in this magical world. Love this movie so much. I wrote a little piece on it end of last year during my 'Five Nights With...' series. The familial bond and ever-reaching atmosphere of hope that is laced into the dire circumstance makes this such a beautifully complex and impactful film. I'm glad you enjoyed it! I checked out your post; nice job! I definitely saw the connections with Grave of the Fireflies despite the very different ending. Both make us feel so much for the child characters. I like what you say about the love for nature, and how Totoro springs from this friendly landscape, I hadn't thought about it in that way before. Probably the most heartwarming/cute Ghibli film I can think of, although it allegedly does also have dark hidden meanings, if you believe the rumors. You can google them. To me, the film feels a little bit like Alice in Wonderland, where you are not sure whether it's the person’s imagination, or the events are actually for real. I read about the possible hidden meanings, which sound like a pretty big stretch. I'm not saying there's no chance, but they sound a little flimsy. I don't think that Totoro and the cat bus are in the girls' imagination, but it's open to interpretation for sure. This is probably the youngest skewing of Miyazaki's films, but like you said it is still very enjoyable for adults. I liked it a lot. A little scene I remember being charmed by was when the girls were just sitting up in a tree at night with Totoro blowing into something to make the sounds trees make in the wind. I think some of those quiet moments like the one you mention are the reason this movie works so well. The scene at the bus stop with the umbrellas is one of many scenes that stand out because they take their time and bring out the charm. I liked this one a lot. There's not a great deal of plot to contend with, but I really didn't mind. So much of it is simply being involved in the world that Miyazaki creates, and that's really enough. I love when Totoro discovers what rain sounds like on an umbrella. That and Catbus(!) are my favorite parts of the film. Steve, the cat bus does not disappoint! It only appears briefly but was easily one of my favorite parts. There's definitely a lot less plot than some of the more recent Miyazaki fantasies, but it still worked for me. Hi Dan, I'm glad you added this to your blind spot. My sister is in love with Miyazaki animes. It sounds like a sweet film. I may watch this with my daughter. I think this Miyazaki film in particular is a great choice to watch with kids. Ponyo is another strong example, and my daughter also really likes that one.